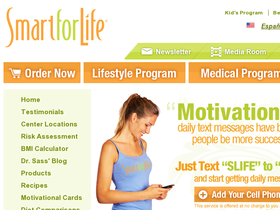 Smart For Life is the perfect place to visit if you are in search for a simple and professional weight loss system. Their expert physicians will make sure that they cater to the requirements of each individual in an exclusive manner. They have their clinics all around the globe for easy accessibility. Their success is based on the pillars of commitment, excellence and an inexpensive outlook. The huge range of Smart For Life hunger controlling foods will make sure that a safe procedure leads to weight loss. The Cookie Diet Centers of Smart For Life is another of the exceptional advantage they have for their customers. They manufacture weight control muffins, squares, desserts, shakes and more for all those who want a piece of the cake without increasing an extra inch of their body. Check back at 58Coupons.com often for the best savings and coupons. Right now when you buy 5 weeks of cookies from the-cookiediet.com, you'll get a week's supply free! Click link for details. SmartForLife wants you to get started on their Cookie Diet today, and free shipping couldn't be a better incentive. The Smart Shake Variety Pack has you covered with 5 different flavors and a total of 10 shakes for you to enjoy as part of your diet plan. See site for ordering details. The Smart Variety Pack includes all kinds of goodies you can enjoy and lose weight at the same time! You'll receive 4 different cookie packs, 3 shake packs, 3 soup packs and more. Click for details. Get SmartforLife's 2 Week Smart Cookie Kit for just $80 when you order now. Click link for details.